Stairs are some of the most difficult finishes to protect. The vast majority of floor protection products struggle to protect stair treads because they cannot stay attached to the backs of stairs without a laborious process of cutting and taping. While this method works well for protecting stairs and we have had many customers rely on this method with CoverGuard and RamBoard, it is very time intensive. To save time protecting stairs we recommend using Hard Surface Films. Films feature adhesives which allow them to quickly roll onto and stick onto stairs. Hard Surface Films offer 3-mil protection from dust, boots, and light equipment. While not as strong as plastic or fiber based floor protection products, films make up for it in their ease and versatility of use. Vertical surfaces, undersides of finishes, and a wide variety of finishes can be protected by films. Films can protect tile, wood, granite, rubber, linoleum, and most other solid surfaces. We offer Hard Surface Film in 24″ x 200′ rolls and 36″ x 500′ rolls. Films are rated for 45 day use. If needed for longer, films can be quickly removed and reapplied, ensuring that finishes are protected for the duration of a project. 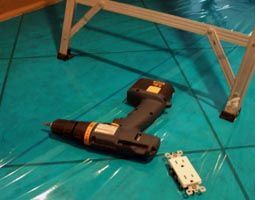 This entry was posted in Product Testimonials, Surface Protection, Uncategorized and tagged adhesive film, floor film, hard surface film, surface protection by admin. Bookmark the permalink.